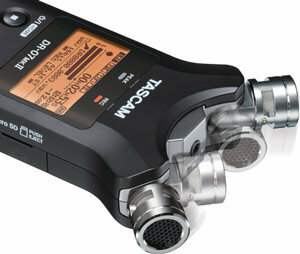 TASCAM's DR-07mkII puts premium recording quality in the palm of your hand. Up to 96kHz/24-bit Broadcast WAV film recording provides better than CD quality to capture every detail. Record WAV or MP3 files to the included 2GB microSD Card, or expand with your own microSD & SDHC media. Like all TASCAM products, the DR-07mkII is simple to use with functions like two-button record and the Quick Menu for fast setting changes. Attached to the DR-07mkII are a pair of cardioid condenser microphones. The stereo microphones can be arranged in an XY recording pattern for tight stereo imaging or in an AB pattern for a more ambient recording. The built-in microphones capture a wide, natural frequency range suitable for any type of voice or musical recording. A 1/8" microphone input is also available for adding your own stereo microphone or recording a line-level source. Perfect for songwriters, the DR-07mkII allows you to build up an arrangement part by part for a full production. Record a guitar demo, then try out a melody by singing along with your previous take. Your original recording is kept, and a second, mixed file is created. The DR-07mkII includes stereo reverb you can use on playback, or use it during recording for a pro, polished sound. A built-in stereo peak limiter prevents unexpected loud sounds from distorting your recording. Just flip it on to keep sudden jumps from ruining your takes. Like most TASCAM handheld recorders, the DR-07mkII includes playback modes to loop a section of playback or slow it down without changing the pitch, perfect for learning new music. A built-in speaker is included for checking recording without headphones. The Level Align feature smooths out level jumps during playback to help you monitor your raw, unmastered recordings. If you have any questions about this product by Tascam, contact us by completing and submitting the form below. If you are looking for a specif part number, please include it with your message.